Before we dig into the list, here are a few caveats. I did my best to find the correct books, but there might be a few errors. The links may not take you to the exact book on Eric’s bookshelf. If there was a newer edition or the paperback looked better, I defaulted to the newer/shinier version. If you spot an error, leave a comment below or tweet me and I’d be happy to fix it. So there it is! 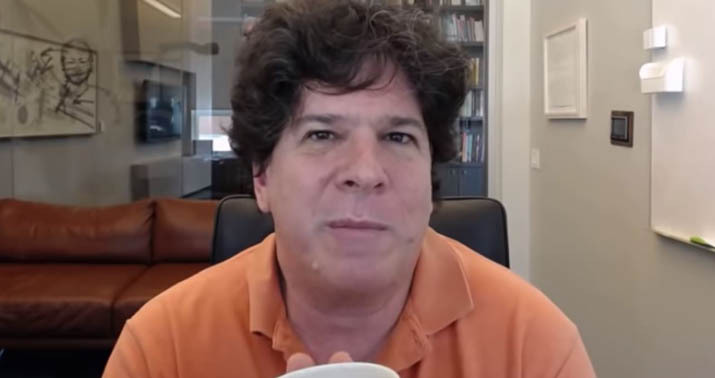 The top shelf of Eric Weinstein’s bookshelf (the one he shared, I’m sure he has more) had 33 books and I was able to identify 29 of them. Also, there are 4 titles where I could see the title, but not determine the exact book. Let me know if you can figure out the missing ones. If you’re looking at the picture in the original orientation, my list goes from right to left. As you probably already noticed, I included Amazon links for some of the books. These are affiliate links and I earn money if you purchase the books via these links. They are also an easy way to include images. This took a while to compile and I’d appreciate you using the links in exchange for the time I spent putting this list together. For the books without direct Amazon links, just copy/paste the full title and you shouldn’t have a problem finding the book. I’ll be doing separate posts for each shelf. Thanks to Eric for sharing!